Before we had settled into America, a Native American tribe, the Narragansett people, ruled Rhode Island. They lived like regular people, working together to get something done. The down-side to that, though, is that you have to share houses with them, because they helped you. That way, your neighbors were very close to you in both ways. The down-side to the down-side is that you have wigwam houses, which are really small. You also couldn't just go to someone else's house to try and get some room, because they were divided into a lot of different parts, sort of like how the United States is made of different states, which each have someone who takes care of it, instead of the president. Same thing with the Narragansett people. Each part has a separate chief for it. The Narragansett people lived regular lives, until the Dutch came from Europe. This was part of the beginning of the Fur Trade. They traded valuable tools and beads for fur. The Native Americans wanted what the Dutch traded them, and the Dutch liked what the Narragansett people gave them. One time, a chief was visited by an English settler named Roger Williams, who wanted to buy land. Williams was very nice, and was liked by the Narragansett. Williams was able to keep peace between the Europeans and the Narragansett for a long time. After a while, each group mistrusted each other, and the Europeans started taking land belonging to the Europeans. It was like they were using Williams to get them more, instead of just taking all of it at once. This continued, and, of course, the Narragansett tried to resist. This resulted in big battles, and the Narragansett were forced to make allies with other groups of Native Americans. In the war, many died, and the Narragansett were forced into hiding, but not defeat. The Narragansett scattered, knowing that more war could lead to complete and total destruction. The hatred between the Narragansett and the Europeans didn't last forever, though, and in 1978, Rhode Island gave some land back to the Narragansett. Even today, the Narragansett live with their heritage and culture in reservations all over America. The United States was born in the Northeast. Before we were the United States, the Northeast had nine out of the thirteen colonies. When the colonies protested against England, the Northeast was right up there in front of them, protesting. The American Revolution was started in the Northeast. Soon after, the Declaration of Independence was signed in the Northeast. The Constitution was written there. Benjamin Franklin was born there. All the capitals of the United States were there. It only made sense for it to be the entrance for most immigrants traveling to America. Immigrants traveled to America for jobs, something to call their own, and for freedom. America was a new and fresh land that was supposedly better than other countries. People came there from everywhere. China, Turkey, Africa, you name it. In some years, most people came from one place out of all of the others. Like from 1820 to 1860, more people came from Great Britain, Ireland, and Germany. Most people came to America through Ellis Island, in New York. Immigrants that came to America couldn't be in any health besides perfect health. You had to be perfectly healthy, because they didn't want that disease in wherever you are. 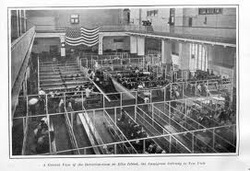 By 1954, when Ellis Island closed immigration stations, more than 12,000,000 immigrants had gone to America! Immigrants have given our country, America, many gifts. Albert Einstein was a German immigrant. Alexander Graham Bell was a Scottish immigrant. And there are many more. Even now, immigrants still come from far and wide. Mostly, though, the purpose has not changed much. Everyone comes for freedom. The Northeast had many changes in America happen in it. One of the biggest ones was anti-slavery, or an abolitionist movement. Slavery was very big. People captured Africans, took them to America, and sold them as slaves. Slavery was part of the triangular trade, and a lot of people had a slave. One of the things that pushed slavery was pride. White people believed they were regular, and therefore, better, and believed people with darker skin had no rights and had to obey them. Then, it was further pushed by relaxation and loss of burdens, which could be done by the slaves. It was kept up, because people sort of enjoyed it. People spoke against it in many places, even the South, where it was strong. But the Northeast was the center for rights. 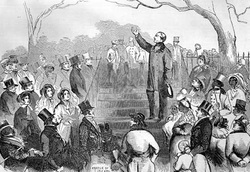 In 1833, the American Anti-Slavery Society was made with the writer, William Lloyd Garrison, two speakers, Fredrick Douglas and Sojourner Truth, and many other people who were against slavery. 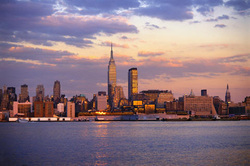 New York City, Boston, and Philadelphia are the three largest cities of the Northeast. Baltimore and Providence are also important port cities. They are centers of culture, transportation, and commerce. They began as ports for large ships to trade with Europe. Trade with Europe was extremely important to the colonists when they first arrived. Merchants opened shops near the ports to sell imports, items that were brought from abroad to sell, and exports, an item from one country to be sold in another. As the port cities continued to grow, new stores and industry jobs contributed to the growth of the Northeastern cities. As the colonists continued to explore and move west, new cities began to flourish near major rivers and canals. Boats were used to transport resources to and from these ports. Pittsburgh was founded where three major rivers met. Today, shipping and transportation are still very important to Northeastern cities. They have also become the center for health care and high-tech industries.